I got to go to my first Ugly Christmas sweater party this weekend and, wouldn’t you know it, I had no ugly sweater to wear (insert: that’s what you think!) So I went down to the St. Vincent de Paul by my house and scoured the racks for way too long. I found a couple of sweaters, but I felt bad buying them because they were still in great shape – relatively speaking of course – and someone might buy them to legitimately wear. Plus I was looking for something more along the .99 cent tag rack. 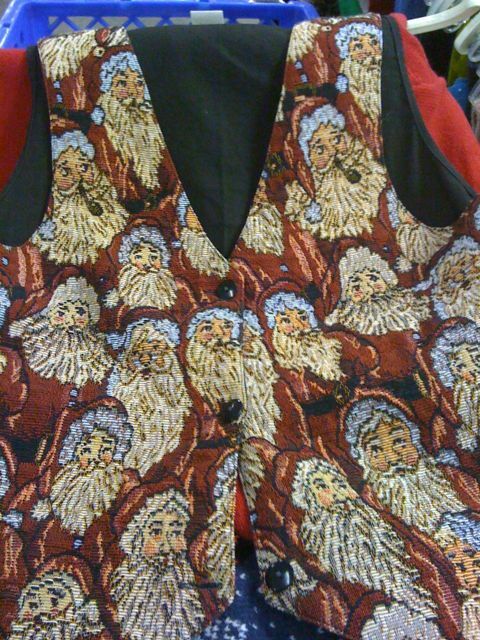 Just as I was about to cave and buy a sweater that could’ve come straight from my Baba’s closet, I found this sweater vest (on the .99 cent rack!) covered in Santa faces. I’m not sure how someone wore this legitimately the first time around, but they did, and it was probably in the early 90’s with Christmas Light Bulb earrings. 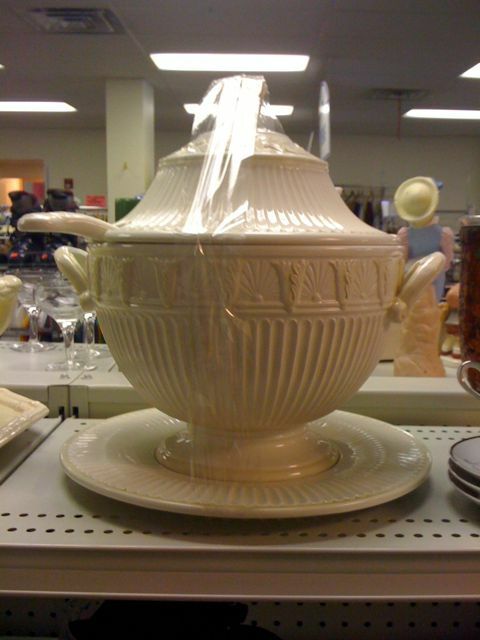 The other big find of the day was this soup tureen. I’ve wanted one since I gifted a tureen to my mother a few years back, but they’re always so expensive and rarely do they have the plate on the bottom. Sometimes they’re crazed and sometimes they’re chipped, but this one was in immaculate condition. Ok, there is a bit of crazing on the plate, but the bowl, lid and ladle are perfect – yay! It’s pretty and it’s all white – so it’s sure to go with everything I’ll ever own – and this was confirmed by the little old lady who stopped to chat my ear off and wanted to see my find. I think she was slightly jealous, but I’d be willing to bet she has her own pretty soup tureen at home preserved with all her other pretty china just waiting for a special occasion, like, if the Pope stops by. I can’t wait til the first time I get to serve 144 ounces of soup!